The global geopolymer market was worth US 3.8 Billion in 2018. Geopolymers are inorganic ceramic materials characterized by networks of mineral molecules linked with covalent bonds. They can be classified into two groups, namely, pure inorganic and hybrid (organic-inorganic) geopolymers. Although geopolymers like obsidian occur naturally, they can also be synthesized chemically. Geopolymers have an amorphous microstructure at room temperature owing to which they have high heat resistance and can be used for thermal insulation. Commercially produced geopolymers are currently used in fire and heat resistant coatings and adhesives, medicinal applications, high-temperature ceramics, and toxic and radioactive waste encapsulation. Geopolymers offer advantages such as high strength, ultra-porosity, low drying shrinkage, low creep and acid resistance. On account of these properties, they are used to substitute Portland cement as a binder in concrete. They are also utilized for repairing bridges, tunnels, roads, and in the rehabilitation of pipes and structures in the civil infrastructure, oil and gas, and chemical industries. Moreover, geopolymers are cheaper than Portland cement, and their production emits lesser carbon dioxide. With rising environmental regulations and emission strain on the cement industry, the demand for geopolymers is increasing. 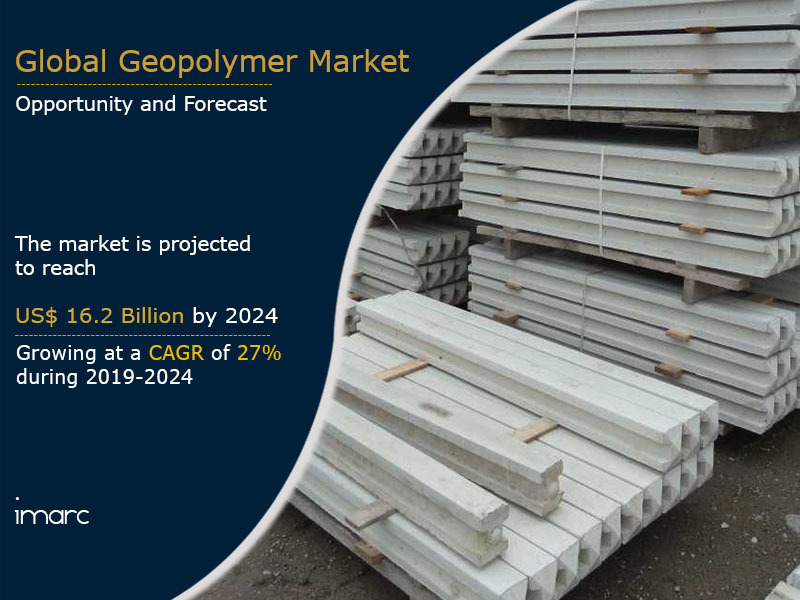 Furthermore, factors such as technological developments and innovations in the construction sector are also contributing to the growth of the global geopolymer market. Looking forward, the market value is projected to reach US$ 16.2 Billion by 2024, exhibiting a CAGR of around 27% during 2019-2024. Based on the application, the market has been segmented into cement and concrete, furnace and reactor insulators, composites, and decorative artifacts. The cement and concrete segment currently accounts for the largest share. On the basis of end-use industries, the market has been segmented into building construction, infrastructure, industrial, art and decoration, and others. The competitive landscape of the market has also been examined with some of the key players being Imerys Group / Ags Argil's & Minéraux, Milliken & Company Inc., PCI Augsburg GMBH, DowDuPont, Rocla, Wagners, Universal Enterprise, Schlumberger Ltd, Murray & Roberts Cementation Co. Ltd, Banah UK Ltd, Zeobond Pty Ltd, Uretek, BASF, Corning Inc., Nu-Core, Pyromeral Systems and Airbus. How has the global geopolymer market performed so far and how will it perform in the coming years? What are the key regional markets in the global geopolymer industry? What is the breakup of the global geopolymer market on the basis of application? What is the breakup of the global geopolymer market on the basis of end-use industry? What are the various stages in the value chain of the global geopolymer market? What are the key driving factors and challenges in the global geopolymer market? What is the structure of the global geopolymer market and who are the key players? What is the degree of competition in the global geopolymer market? 14.3.2 Milliken & Company Inc.